In the ancient medical system in India there exists one of the oldest and most time tested approaches to nutrition. Science of food and diet became an integral part of the philosophy of rnan, of his consciousness and of his relation to the Universe The result was an approach to diet that was unsurpassed both in its profundity and sophistication as well as in its practicality and simplicity. Here the selection and preparation of food is seen as inseparable from the treatment of disease and cultivation of vibrant health. Both these goals are in fact a part of traditional Indian medicine. The body protects itself against the various diseases by: 1. Physical barriers like the skin and mucous membranes which form the security guards preventing the entry of foreign bodies like the micro organisms, 2. Systemic immunity by which specialized cells respond to the sensitization of foreign bodies like the bacteria, viruses, fungi, and neoplastic cells. The cells involved in the immune responses are located throughout the body. Some are in fixed tissues like the bone marrow, thymus, Iymph nodes, spleen, Kupffer cells of the liver and Peyer's patches of the small intestine, while the leucocytes are mobile and circulate in the blood stream and go to the site of infection when required. Imrnune responses are of two types, nonspecific and specific. The non-specific immune response involves a generalized defense to any foreign body. A specific immune response is acquired. Here the response is specific and selective, in that it is mediated by lymphocytes specifically for that particular foreign body or antigen. There are two types of such specific immune responses. One is known as Cell-Mediated Immunity and the other is termed as Humoral Immunity. It involves the thyrnus. Here the immunity is mediated by thymus-dependent lymphocytes designated as 'T' cells. These 'T' cells are produced by the bone marrow stem cells and are derived from the thymus after getting educated or mature there. So a cell-mediated immune response is triggered when 'T' cells are sensitized by an antigen. The 'T' cells respond to the antigen directly and produce certain substances or mediators called lymphokines. These lymphokines then proceed to kill or destroy the antigen. The 'T' cells are further divided into various sub-populations according to their functions in the immune response. They are mainly helper, suppressor, memory and cytotoxic or killer cells. Cellular immunity is measured by delayed hypersensitivity. In, for example, the Tuberculin test, a small amount of antigen is injected under the skin. Redness or erythema and hardening or induration in the skin is looked for after 24 to 48 hours. Presence of erythema and induration indicate a positive reaction which indicates that 'T' Iymphocytes and macrophages have migrated to the site of antigen injection. As shown in the figure illustrating Humoral Immunity, here the immunity is mediated by 'B' cells or 'B' Iymphocytes. Here the antigen is presented to the B Iymphocytes via the cooperation of the 'T' Iymphocytes and macrophages. Once the processed antigen is presented to the 'B' Iymphocytes, they are triggered and elicit an immune response by producing the various immunoglobulins or antibodies to the stimulating antigen. The various classes of immunoglobulins being designated as IgG, IgM, IgA, IgD and IgE according to their molecular weight and properties Antibodies or immunoglobulins activate yet another system, called the complement system. The complement system is made up of nine components, which are triggered sequentially in a cascading system bringing about antigen destruction. Upto 1955, it was generally agreed that severe protein deficiencies suppressed antibody formation. In addition, deficiencies of pyridoxine, pantothenic acid, and pteroyl glutamic acid resulted in a suppressed antibody response. Deficiencies of components of the vitamin B complex also cause some depression in antibody formation. Some questions were debated regarding the role of malnutrition in defective release of antibody or increased destruction resulting in subnormal values. Naturally occurring states of malnutrition are difficult to interpret largely because deficiencies usually involve multiple dietary factors. This problem is further compounded by infection, anorexia, debilitation and a negative nitrogen balance. For example a marked reduction in food intake is seen commonly with vitamin and mineral deficiencies, thus contributing to the effects of protein-calorie undernutrition. Coming to protein and protein-calorie malnutrition, studies conducted by Cooper et al have revealed that the number of plaque-forming Iymphocytes became activated and the corresponding amount of antibody synthesized was directly correlated with protein or protein-calorie intake, when three levels of dietary protein were given (6%, 12%, 27%). In contrast, under conditions of chronic protein or protein calorie deprivation, some 'T' cell mediated immunologic functions were decreased e.g. proliferative responses to mitogens like Concanavalin A and Phytahaemagglutinin (PHA), development of delayed hypersensitivity and formation of migration inhibition factor (MIF). Studies on tumour immunity further illustrated the depression of B-cell system and sparing of the 'T' cell system when moderate protein-calorie restriction occurred. 'T' killer cell activity was also reduced in experimental tumour systems, so also the formation of cytotoxic and blocking antibodies in protein caloric malnutrition. Decline in the phagocytic function was also observed, and depression of opsonization was evident. Serum complement levelsC3, was significantly lower. So protein or calorie malnutrition in human beings results in marked impairment of both humoral and cell-mediated functions. Severe thymic atrophy and associated 'T' cell deficiencies were observed in undernourished children. A depression of 'T' helper cells and a possible increase in 'T' suppressor cells also could occur in protein-calorie malnutrition. Salimoner et al and Schlesinger et al reported decreased killer cell activity and decreased production of interferon in children with protein-calorie malnutrition, and patients with marasmus. Reduced levels of serum IgA in pharyngeal secretions, tears and saliva could be responsible for the compromised resistance to organisms that cause respiratory infections. Impairment of sIgA is thought to represent depression of IgA synthesis in the submucosa or impaired synthesis of secretory components or both. These observations are compatible with the findings in protein-calorie malnutrition, of the loss of intestinal epithelium, mucosal thinning and atrophy of gut-associated lymphoid tissue (Tablel). Most clinical studies of nutrition-related immuno-deficiencies in humans involve multiple deficiency states complicated by infection. A summary is well elucidated in Table 2, as shown by Beisel et al. Ashkenasy noted that isoleucine and valine deficiencies impaired the recovery of both thymus and peripheral Iymphoid population after acute protein deficiency. In addition, deficiencies of methionine and cysteinecystine also resulted in delayed effects on the recovery of the thymus, Iymph nodes and spleen. The above mentioned amino acids, when deficient also cause severe Iymphocyte depletion of gut-associated Iymphoid tissue similar to that seen in total protein malnutrition. Tryptophane is also vital in the maintenance of normal antibody production. Methionine appears to be essential for Iymphopoiesis. Deficiencies in minerals also have an effect on the immune systems. Zinc deficiency causes atrophy of lymphoid tissue and produces abnormalities in both cellular and humoral immunity. The average adult must obtain atleast 15 mg of zinc per day from the diet. Clinically zinc deficient children present with lymphopenia, reduced capacity to exhibit delayed hypersensitivity and increased susceptibility to disease. A similar pattern was observed in children with acrodermatitis enteropathica, a defect in intestinal absorption of zinc described in 1942. However, when zinc was supplemented, the children were cured. Zinc is also necessary for stored Vitamin A in the liver to be released in the blood. Iron deficiencies exhibit impaired delayed hypersensitivity reactions as well as defective neutrophil and macrophage killing functions. Vitamins play an important role in the immune response since they function as co-enzymes. Experiments were carried out by several doctors on human beings with a pyridoxine and pantothenic acid deficient diet, and severe impairment in antibody response resulting in hypogammaglobulinaemia was observed. Pyridoxine deficiency markedly affects cell-mediated immunity. Vitamin C deficiency abolished tuberculin hypersensitivity, impaired the formation of collagen, the fibrous connective tissue that is so important in the repair and healing of wounds. It was shown as early as 1943 that proper levels of ascorbic acid maintained the activity of white cells'the bacteria destroyers' of the blood stream. Large doses of Vitamin C inhibit the action of histamine released in an allergic reaction. Vitamin C may also be involved as a co-factor in the production of thymic humoral factors. Vitamin A maintains epithelial and mucosal surfaces and secretions as a form of primary defence. When vitamin A is deficient, the innermost, columnar, mucus-secreting epithelium may lose its ability to maintain itself and areas degenerate into their layered flattened cells called squamous metaplasia. Such cells may be seen in the glandular epithelium of the cervix in women. Teenagers whose diet is deficient in vitamin A tend to develop acne which may be treated with zinc. Zinc, as mentioned earlier, helps release the stored vitamin A from the liver to the blood. Furthermore vitamin A deficiency significantly reduces both cell-mediated immune responses and humoral immune responses. Vitamin B12 and folic acid deficiencies result in megaloblastic changes of replicating cells. Biotin deficiency results in impairment of both primary and secondary antibody responses. Immunological deficiencies in some malnourished children are a result of thymic atrophy. Marked depression of cell mediated immune responses was noted in all severely malnourished children. The recovery of cell-mediated immune responses reverted to normal after nutritional rehabilitation. Serum complement levels are also markedly reduced in children with protein calorie malnutrition. Suppression upto 50% of lysozyme secretion into tears, so also the synthesis of secretory IgA is markedly reduced. So it can be concluded that protein-calorie malnutrition has a relatively greater effect on cell-mediated immunity than on humoral immunity. Besides an impairment of the B & T Iymphocyte network and defective afferent responses, it is possible that impaired phagocyte function may also result due to malnutrition. Phagocyte defects in protein calorie malnutrition could include impaired chemotaxis, phagocytosis, bacterial action and metabolic responses. Single vitamin deficiencies may also impair immune response. Of the so called trace elements, zinc undoubtedly plays an essential role in the lymphocyte and mononuclear phagocyte systems. Vegetarian foods which are vegetables, fruits, nuts, cereals, sprouted pulses, milk and milk products contain all the essential nutrients required for maintaining the integerity of the immune systems. Vitamins and minerals which are so vital in the functioning of the immune system are best availed from fresh fruuts and vegetables. Hence a vegetarian diet is apparently adequate in all respects to maintain good immune function. In fact, if well balanced it may be more suitable to the efficient functioning of the immunological system. Beisel W.R. et al, JAMA 1981:245;53. Beisel W.R. Am.J.Cl.Nut. 1982:35; 417. Ballentine R. Diet & Nutrltion; 1982. Chandra R.K. Can J. Physiol 1983:61; 290. Chaman H.N. JAMA 1987:258; 2834. Das K.C. ; Hoffbrand A.V. British J. Haematol 1970:19, 459. Moore S.T. & Bymes M.P. A Vegetarian Diet, 1975. Shigzal H.M. Surgical Ana 1981:13; 15. Pilich S.M. Phys effects & health consequences in dietary fibres, l987. Roitt, Ivan. Essential Immunology 6th ed. 1988. Stites D.P. ; Stobo J.D. ; Fundenberg H H & Wella J.V. 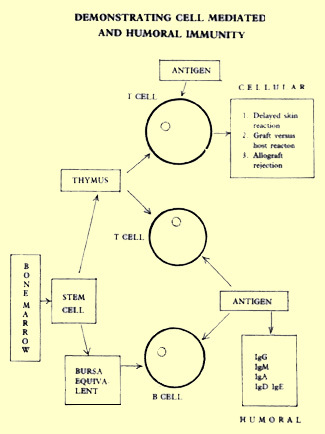 Basic & Clinical Immunology 1982.